Russian filmmaker Sergei Eisenstein is best known for his pioneering use of montage, a technique of editing together seemingly disparate images to create new connections in viewers’ minds–and in Eisenstein’s case, to drive home political messages. His groundbreaking approach in the 1920s still influences countless music videos, commercials, and films today. 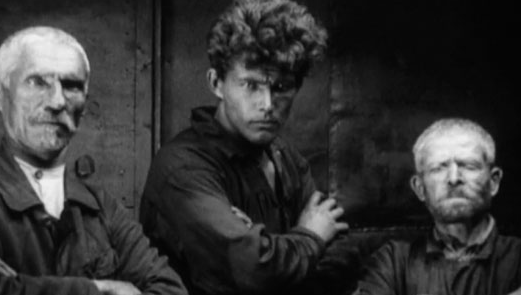 The weekend of July 24-26, 2015, the Trylon Microcinema will showcase Eisenstein’s 1925 debut feature film, “Strike,” the dramatic story of a strike in pre-Revolution Russia and its brutal aftermath. Select showings will feature live musical accompaniment by The Rats and People Motion Picture Orchestra. “Strike” showings this weekend are a reunion gig for many of the musicians playing, according to Rats and People violinist Beth Dill. Dill first began accompanying silent films while living in St. Louis in the mid to late 2000s, joining composers Brien Seyle and Matt Pace and other St. Louis-based musicians. After Dill moved to the Twin Cities in 2011, she missed playing Seyle’s and Pace’s music, so she asked her former bandmates for permission to use their scores and form another Rats and People Motion Picture Orchestra in Minnesota. They gave her the go-ahead, and Dill has been playing with various Minnesota musicians ever since. For this weekend’s showing of “Strike” at the Trylon, Dill and her Minnesota band mates Seth Hayek (percussion) and Teresa Mager (viola) will be joined by the St. Louis-based Seyle on violin and Pace on piano. The group will be rounded out by St. Louis Rats and People member Matt Frederick on trombone and Minnesota-based Michael Legan on trumpet. The showings will be the first time that Dill has played with her St. Louis bandmates since 2009, and she is absolutely elated about it. For this weekend of showings, Dill and the other musicians will probably need all the musical and emotional support they can get from one another. Of all the silent movies that Dill has accompanied, she says the roughly 90-minute “Strike” is by far the most demanding. As difficult as the film is to accompany, Dill feels strongly that it’s worth the effort, both for the musicians and for moviegoers watching the film. The film’s most famous sequence crosscuts between the graphically depicted slaughter of a cow and the massacre of the striking workers, which might give some prospective audience members (me included) cause for hesitation. Dill admitted that she herself has trouble with that part of the film, but offers a suggestion for the squeamish about how to handle the sequence. “Strike” will play at the Trylon Microcinema, 3258 Minnehaha Avenue in Minneapolis, over the weekend of Friday, July 24 through Sunday, July 26. There will be showings at 7 and 9 p.m. on Friday and Saturday, and at 5 and 7 p.m. on Sunday. Only the 7 p.m. screenings will feature live accompaniment by The Rats and People Motion Picture Orchestra MN, and tickets will be $10 for those shows. For all other shows, admission is $8. Tickets can be purchased in advance at take-up.org. In this summer of landmark Supreme Court decisions and presidential candidates throwing their hats in the ring, it's fitting that this July, the Heights Theater is sponsoring “The Political Circus,” a series of six classic, politically-oriented comedies. One of the comedies on the schedule holds special interest for silent film fans: silent icon Charlie Chaplin’s first excursion into sound, the 1940 film The Great Dictator.